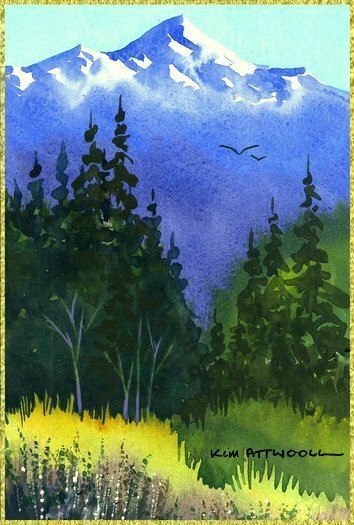 The beauty of landscape paintings is that they're probably the most used type of illustration for all types of greeting cards. There's a certain neutrality about a landscape that gives the painting a lot of flexibility when it comes to occasion. At the same time, we can be use it quite specifically. Send a beach scene with palms to talk about a holiday on some exotic island. Use a cottage or mountains to represent a peaceful getaway from city bustle and commuting to work. To see a larger version, just click on the image then click anywhere to close the image. The size of the image will depend on your screen resolution settings. 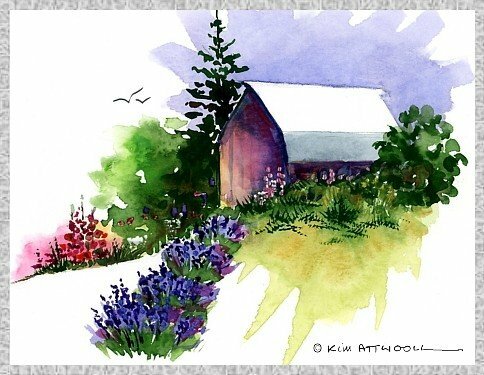 This relaxing painting of a barn was inspired by all the lavender that grows in the area where we lived- The Olympic Peninsula in Washington. The sky and foreground are painted vignette style.....the paint doesn't go out to the edge. I love enhancing the lavender and side of the barn with raised paint. This painting lends itself to peaceful images such as "Thinking of you". Yellow mountain flowers. This dramatic landscape painting shows a clear definition of foreground, middle ground and background. It has universal appeal as it invites the viewer into the landscape. Notice the two birds traveling across the terrain. I love to finish my paintings with the two friends exploring new territory together. This sort of card lends itself to framing and looks good anywhere. A dear aunt taught me that every room should have a touch of blue in it!